To answer that question, you need to know how to write an objective statement that can sum up all the strongest points of your resume within a few sentences. Above all, it will tell the Hiring Manager why the company should hire you. 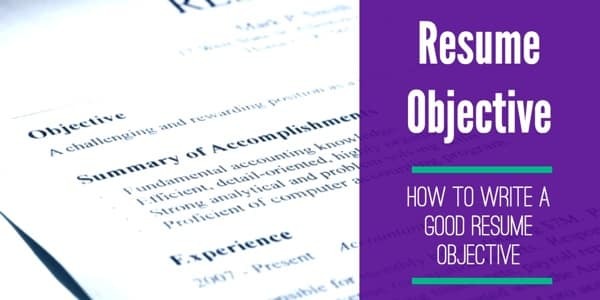 Resume Objective Vs. Resume Summary: Is There A Difference? A career objective or resume objective is a short, targeted statement that presents your value proposition to the company. Furthermore, it identifies the skills, abilities, experiences and defining attributes which make you the best fit candidate for the job. Short, targeted statement – A good resume objective is a concise summary that gives the Hiring Manager a good idea of who you are. Even more, it describes your purpose for the application and what you offer to the company. You can write an effective objective statement in 3 to 4 sentences. Value Proposition – The resume is your marketing tool; it contains information that could increase your value or worth to the prospective employer.It answers the question, “What can you do for our company?”The resume personifies your brand. Finally, the objective statement is the vehicle that best delivers its message to the Hiring Manager. Best Fit Candidate – Companies are no longer just looking for candidates that have high education degrees. Having bright academic performance or longest and most awarded tenures are not that important.They want people who can fit the organizational culture. The resume objective is your opportunity to complement your skills and abilities. Even more, describe your experiences with the strongest attributes that define your approach to work. The purpose of the objective statement is to pique the interest of the person reviewing your resume. For the moment, the statements are mere “claims”. These have to be validated by your work experience, educational attainment, and summary of skills. You want to encourage him/her to explore the rest of its contents further. Some people may tell you the resume objective is no longer relevant; that it’s a waste of time because no one will bother to read it. In the first place, it is located at the top third of the resume, usually below Contact Information. You can be assured, the recruiter will come across your resume objective. Second, the objective statement is your voice on the resume. It’s your formal introduction to the company. Think of it as extending a handshake to the recruiter. Do you think the recruiter will refuse to shake your hand? This is your opportunity to tell the prospective company why they should hire you. And if you compose a statement that brilliantly outlines your value proposition in 3 to 4 sentences, the recruiter will certainly read through your resume. Having a good resume objective is also important for those who are planning a change in career. What do you think would happen if a company put out a job ad for a Digital Marketer and a resume with “Five years experience in accounting and operations analysis” comes on the recruiter’s desk? If it didn’t have an objective statement, the Human Resources officer might think the resume was sent to him/her by mistake. As a result, the resume may be placed under file. The objective statement should explain why the applicant decided on the change of career. Consequently, it would shed light on his/her lack of experience and the relevant qualifications. For people who are planning a career change, the resume objective gives the platform to share your story with the company. It will set the context for your application. Furthermore, it will maintain course for the Hiring Manager to find out why they should hire you over other candidates. Here’s an important tip: If you want to add more impact to your objective statement, include a cover letter with your resume. A cover letter will lend support to your resume objective by providing more details on the information indicated. Yes, there is a difference. A resume summary is not the same as a resume objective. It’s easy to get confused between the two because they are short summaries of what you can do. However, with the resume summary, you are emphasizing the strongest points. These relate directly to the requirements of the job. For example, let’s assume you have 10 years experience working as the Information Technology Manager of a commercial bank. You plan to apply for the same position at a universal bank. A resume summary may be more effective than a resume objective. Employment statistics show that a job ad attracts an average of 250 applicants. Unless specified that the company is hiring multiple candidates for one position, your immediate challenge is to beat 249 competitors. You need every advantage you can get to stay ahead of the competition. A good resume objective can be a game changer if it is properly conceptualized, well-written and presented. Many job seekers fail to land the position because they did not include an objective statement. Or even if they did, it was haphazardly done. So how do you write a great objective for a resume that will catch the eye of Human Resources? Keep It Short – As we mentioned earlier, the resume objective should not take more than 3 to 4 sentences. It’s a short section that will have a huge impact on your application if written properly.That’s why you need to put in more time and effort when writing your resume objective. You have to present your strongest qualifications in such a short paragraph. Always think of being concise. Customize Your Objective Statement – Are you applying for 3 jobs? Then prepare 3 distinct and original objective statements. Don’t submit the same one to every company you apply for.Hiring managers have developed an intuition that can tell if you submitted a run-of-the-mill resume objective. Make sure your statements are customized to the job and the company you are applying for. Highlight Your Value Proposition – The company has 249 other applicants for the job. You need the job more than the company needs you.When writing, think of how you can be of benefit to the company not how the company can benefit you. Tell them what you can do or what you can offer that will help the company accomplish its goals and objectives. Use the Right Verbs – Action words make your resume read more dynamic. Using the right verbs will give your resume more energy and further highlight your personality.For example, if you’re applying for a managerial position, verbs like collaborated, coordinated, designated, developed, built, evaluated, analyzed, managed and organized are highly effective. Include Relevant Work Experience – If you’re switching careers, use the resume objective to indicate work experience that is related or utilized skills that are transferable to the position. A professional is an applicant who has work experience of at least 2 years. There are various reasons why someone who has accumulated good tenure would look for new work. It could be for the same job but different company. The applicant may be interested in trying out for the job opening in the same company because it would represent a promotion. He/she may want a change in career. Indicate your technical and fundamental qualifications. These can include highest educational attainment, certificates, licenses and other forms of specialized training. Trader and Securities Analyst with more than 10 years experience trading equities, currencies, and commodities; preparing market reports and analyses, conducting research and representing the company during live television feed. Hard-working, dedicated with an unquenchable thirst for learning; I hope to contribute my knowledge in various forms of analyses: Elliott Wave Theory, Dow Theory, Fibonacci Ratios and economic fundamentals to the continued success of ABC Trading’s clients. Master’s Degree in a Business holder, licensed SEC trader and certified technical analyst. Why is this resume objective effective? At 79 words, it remains compact and concise but has all the details that would attract interest from investment companies. The indicated soft skills: hard-working, dedicated and an unquenchable thirst for learning, nicely complements the hard skills. Hiring managers who come across this level of technical skill will think you need to be hard-working, dedicated and enjoy learning new methods of analysis to invest so much time and effort in becoming a well-rounded trader. The summary of technical qualifications will also set the candidate apart from applicants who cannot match the level of educational attainment and additional certifications. If you have no work experience or if you just graduated from college, you will be looking for entry level type jobs. The competition for entry-level jobs is quite high. Thousands of people graduate from college every year. Like you, they will be looking for their first paycheck. Without actual work experience, the battle now shifts to who has the best skills and qualifications. Indicate your degree; the college course you finished and include any relatable experience.For example, if you’re applying for the position of Market Researcher, relatable experiences would include: getting a summer apprenticeship at an equities firm doing research work or helping your college professor conduct research during your spare time in school. Share your most identifiable and proven traits and how they can help the company achieve its goals and objectives. Identify the behavioral attributes that best describe you as a person. Fresh graduate with a Bachelor of Science degree in Economics with cumulative 1-year experience working as a Research Assistant for Professor Harold P. Jones at the Department of Industrial Economics. I remain confident that my academic background and acquired practical skills in research will greatly benefit Trend Equity’s Market Research Department. Passionate, meticulous and committed to delivering accurate and top quality research and project papers for your company on a consistent level. This resume objective works for a fresh college graduate or someone who is looking for an entry-level position because it puts your strongest credentials front and center. They have a solid background and firm understanding of the fundamental skills required for the job. College graduates have experience working with other people, have taken turns as project managers during group work and can take instruction. Companies will spend less money and time getting the college graduate ready for the job compared to a candidate who has an Associate Degree or a high school level education. High school students looking for work can apply for entry-level jobs, apprenticeships, and internships. These are experiences that will eventually build up your resume and help you land a better job once you complete your college education. Your strongest and most probable traits or accomplishments. The position that you are applying for or the role you want to fill. The attributes or personality traits that make you the best fit candidate for the company. Highly-organized, a hardworking and self-motivated student with a running GPA of 3.77 and proficient in various software programs such as MS Office, Evernote, DropBox, and Asana. Seeking to become the new Office Assistant for McElroy and Sons Trading Company. My dedication and professional work ethic will be assets that can help your company achieve its goals. What office wouldn’t want to hire this high school kid? He/she has an impressive grade point average and can run software programs that are important for office administration. Everything that was mentioned in the objective statement can be proven in the resume and its attachments. At the very least, with a great resume objective like this, the applicant can remain confident that the recruiter will review the rest of the application. The challenge when writing a resume objective to support a career change is to relate the previous experience with the requirements and qualifications of the new job. It’s not unusual for people to decide on a career change after accumulating years of service to an employer. He/she may have had an epiphany during work; an “aha” moment that made them realize they have another calling in life. Relevant information on your current job: designation, years of experience and transferable skills and experiences. The name of the company you are applying to and how your skills and experiences will benefit them. Highly accomplished and results-driven Marketing Officer with more than 5 years experience wants to leverage background in achieving targeted sales quotas, research and ability to productively manage teams for a successful career as an Insurance Agent for DeVille and Carlos Insurance Brokers. The resume objective is good because it clearly relates how his present set of skills, experiences, and competencies will relate to a new career as an Insurance Agent. It will definitely interest the Hiring Manager who would surely want to find out what the applicant has accomplished as a Marketing Officer. Now that you know how to write a good resume objective, you should also learn what mistakes to avoid when preparing one. Some job seekers don’t want to spend much time and effort when preparing their resumes. They want to save time and file out as many applications as they can to prospective employers. So they come up with “fill-in-the-blanks” resumes where they just have to plug in the details and the objective statements are the same. All the time they saved will lead up to more months in the unemployment line. Never submit the same resume to different employers. You should customize it to fit the needs of the employer as stated in the job post. As we mentioned earlier, the objective statement is your voice on the resume. Let it ring loud and clear specifications for the Hiring Manager. This is a resume objective where the spotlight is solely on the applicant and what he/she wants out of the employer. Nothing is stated that would tell Human Resources how hiring the applicant would help the company achieve its goals. College graduate with high academic achievements; multi-awarded and well-experienced in the field of sales seeks a position where my million dollar generating abilities can open up opportunities for top management and a six-figure salary. Human resources may be intrigued by the applicant but the objective statement carries no value for the company. It only serves the interest of the applicant and will most likely find its way in the file shredder. Seeking a long-term, high paying job in any opening with your company. I have the skills and abilities you need to continue your success in the industry. What job are you referring to? What skills and abilities do you have? There’s just nothing here. The recruiter will simply out this resume away and proceed to the next one. We won’t even continue the example because the first sentence alone is 63 words with no signs of a period coming anytime soon. When it comes to the resume objective, size doesn’t matter. Keep it short but concise, usable and relevant. My goal is to land a position with a company that fits my degree, skills, and abilities. When given the opportunity, I will show you that the high salary I plan to ask and negotiate will be worth every dollar and cent. It would be best to conclude the applicant search right now because I am very confident that hiring me will take your company to the next level. No mention of experience and skills, abilities to offer. It’s one thing to be confident and another to come across as arrogant. This type of resume objective reads more like an infomercial than a value proposition. Unfortunately for the applicant, hiring managers won’t be buying what he/she is saying. We’ve shown that a good resumresume objective done right can be a potential deal maker for your application. It is the only section in the resume where you can give the Hiring Manager a glimpse of your personality and a rundown of the skills you bring to the company. The key is to put thought, strategy, and purpose behind your objective statement. Imagine that you are meeting the Hiring Manager for the first time. You are given 10 seconds to tell him/her why the company should hire you. Project your voice unto the resume objective. What would you tell the person out to hire you? What are your strengths? What makes you different from everyone else? If you have 20 qualifications, choose the three that stand out and are relevant to the position. They don’t have to be related to the technical aspects of the job. The best approach would be to dedicate one line for experience or achievements for new graduates, another for skills and the third for ideal personality attributes. Remember the purpose of the objective statement is to get the recruiter interested enough to explore the rest of your resume. It should clearly communicate your value to the employer. If you would like to read more about resume objectives and summaries, check our samples.